The school lunchbox is relentless, demanding to be filled every single school day of the year. It triggers morning dread in parents and caregivers and noontime foreboding in students. However, lunch-from-home doesn't have to be an endless chore or a fast food fail. Get creative with flavors and fun shapes to win over even the fussiest connoisseur. Does your tiny wheeler-dealer trade your meticulously assembled repast to a buddy rocking a bologna on white with mayo? If so, this calls for a reset. Lunch is an important meal, so tempt that tiny bargainer to eat what you pack, even when you're not doing the "mom thing" over his shoulder. Presentation is critical; you can hook your child with how lunch looks. Bright colors and lots of them are hard to resist. Fortunately, healthy fruits and vegetables give you a paintbox of nutritious choices. Finger-friendly foods are easy to eat, so you won't find them wilted in the lunchbox after dinner. Information and imagination are key ingredients. Wholesome food choices and modest portion sizes teach kids lifelong habits that will help them avoid chronic diseases, like diabetes and obesity, later in life. UC Davis nutritionists point out that homemade lunches save money, boost energy and long-term health, keep mental and physical development on track, and say "I love you," a message that contributes to well-being and good digestion. Students who eat a healthy lunch are more attentive and do better in school. That's got to be worth a few extra minutes to whip up a surprise and a sense of adventure instead of the same old sandwich. You're crazy busy and mornings are hectic. Some days just getting your kids on the bus with shoes and a lunch bag is a win. 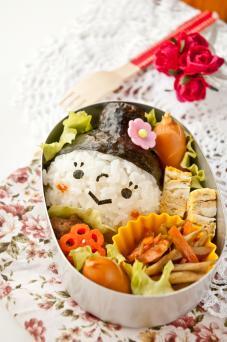 However, once in a while, charm that little charmer with a lunchbox that will bring a smile to his face. Form sticky rice into a ball with a slightly conical shape on one side. Use leftover rice from last night's supper to save time. Tuck any treat your hungry kid will eat into the ball: a chunk of grilled salmon; diced turkey, chicken, or ham. Cut two tiny round eyes, a comma of a nose and a small half-moon smile from a sheet of dried nori seaweed and stick them on the round ball to make a face. Wet your hands and pat the nori seaweed around the conical shape so it looks like a hat or trim it to resemble hair with bangs. The edible seaweed cone is a handle for grabbing and eating that happy face at lunchtime. Add a cupcake paper crammed with crispy potato sticks or Chinese crispy noodles, and an apple or a big homemade oatmeal raisin cookie. It's lunch that says "You matter. Have a happy day," even without the heart drawn on the napkin. Display hint: A large snap-lid container that fits inside or replaces a standard lunchbox lets you arrange the rice ball and side dishes so the first thing your child sees at lunch is a smiley face. Kids and grazing go together like ruminants and summer meadows. Crunchy munchies make the best forage for an easily distracted, midday diner. Plus, these are fun to eat and that means they'll probably get eaten. Cut carrot, cucumber, sweet pepper and celery sticks about three inches in length for quick grabbing and dipping. Keep them in a snap-lid cup or container, separate from other lunch items, to preserve crispness. Fill a small snap-top container with mild hummus or, if your school permits, organic peanut butter. When kids use the crudités as a scoop they get a tiny blast of protein to help energize them for the afternoon. Add plain or sea salt-flecked brown rice cakes, smeared with pear or apple butter and pressed together into a neat "sandwich." Don't forget the dessert graze. 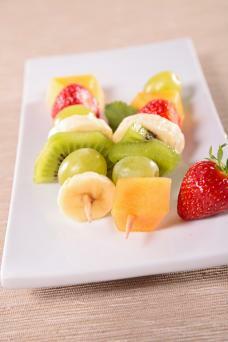 Fruit kabobs, on safe popsicle sticks instead of sharp skewers, hold chunks of pineapple, kiwi slices, strawberries, banana; whatever is in the kitchen and the more colorful the better. Packing hint: A clear snap-top drink cup holds fruit kabobs intact and catches any juices for less mess. Build-your-own lunches break up a dull school day, so pack a DIY South-of-the-Border treat in pieces for easy assembly. Cut circles of whole grain tacos with a biscuit cutter, wipe a little olive oil on one side, pinch a few grains of sea salt over each round and press them into a mini-muffin tin. Crisp the tin of taco shells in the oven for five minutes at 325 degrees Fahrenheit. Stack a few taco shells in one section of a divided lunch box. Fill small containers with shredded lettuce and cheddar cheese, diced or sliced leftover chicken or ham, tiny halved cherry tomatoes, and a cup of plain yogurt sprinkled with taco seasoning for "sauce." A side of crunchy banana chips and slices of seedless tangerine or a peeled clementine turns lunchtime into a fiesta. Stacking hint: Aim for fairly uniform taco shells, wider at the top than the base, so they nest inside each other more easily. Sweeten a dreary school day with a nutritious lunch that looks and tastes like a tea party of delicious desserts. Your reluctant gourmand will gobble up the whole thing, even if lunchtime is usually a foot-dragging affair. 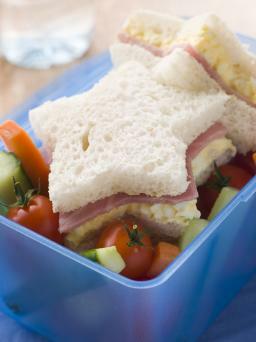 Cut sandwiches in shapes with large cookie cutters or trim the crusts and cut in tiny triangles. Nutella on homemade banana bread is always a winner. 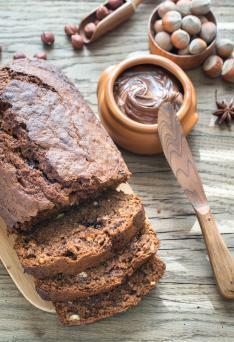 Peanut butter and sugar-free jelly on cinnamon raisin bread is another favorite sweet treat. Pack a small cup of individual strawberries and green seedless grapes, and another cup of plain vanilla yogurt swirled with unsweetened cocoa powder for dipping. The Picky Eater will never suspect how many vitamins and antioxidants you slipped past his finicky yuck-meter. Thermal tip: Tiny, frozen, reusable 'thermos pillows' (round or pillow-shaped) tuck into or next to individual lunch item containers for a more appetizing, less warm and oozy meal. Celebrate your heritage or your family's adventurous good taste with a bento box full of bite-size yummy things to liven up school lunch. 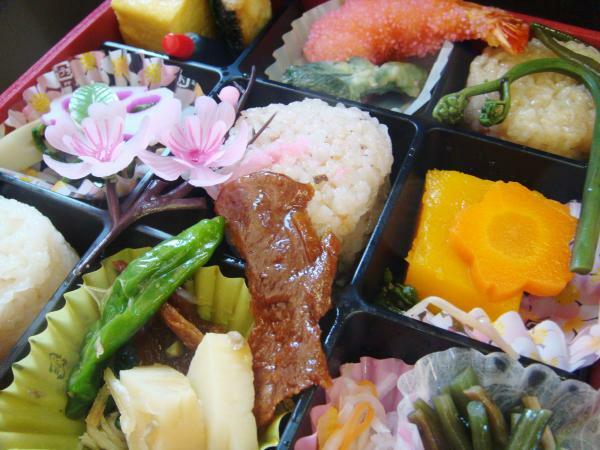 The pretty fitted boxes with removable separate containers will hold Asian specialties such as mini-spring rolls, individual sushi slices, crenelated carrots and pickled vegetables. Or fill the sections with little favorites of your budding gourmet: sliced ham and swiss rolls; a handful of blueberries; multigrain crackers and cheese; half a deviled egg. Added attraction: Send a wonderful children's book to school, along with that well-provisioned bento box, for lunchtime read aloud. Yoko by Rosemary Wells is a charming story of acceptance and cultural diversity that features a bento box and a classroom full of tasty ethnic lunches. Substitute infused water for sugary juice boxes. A reusable water bottle is kind to the environment and you can add a slice of cucumber and a strawberry, a couple of blueberries and a sprig of mint, a chunk of watermelon, a slice of lemon, orange or lime to spring water. By lunchtime the fruits, herbs or veggies will have flavored the water for a healthy, pretty drink. The Big Chill -- a cheap and easy way to keep drinks and perishables cold until the lunch bell rings is to saturate a small clean sponge (buy a bagful from the discount store), place it in a sealable plastic baggie and freeze it overnight. Just toss the "cold pack" in the lunchbox -- the sponge and the bag hold the melted ice as they day wears on, and you can reuse the things indefinitely. Scratch the paper napkins. Go green with a cotton bandana or a plain hemmed linen napkin that is washable, not disposable. A cloth napkin makes the meal feel special and models environmental stewardship for your young activist. Even greener: A no-impact lunch pail keeps treats separated in reusable snack and sandwich bags that are chemical-free and washable. Rinse them out by hand and they'll last longer. Feed your kid, not the landfill. Swap stuff: kale chips for potato chips, peeled and cut-up fruit for high-calorie granola bars, sliced meat from last night's supper for processed deli meat. 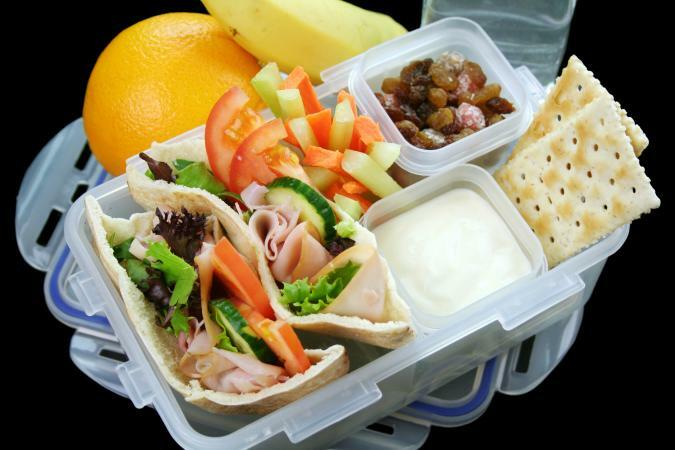 Don't fill a lunchbox with empty calories. A toasted English muffin half, smeared with spaghetti sauce, sprinkled with shredded mozzarella and heated until the cheese melts is an individual mini-pizza. It slips into a round, lidded snack container for no-mess transport. Use cookie cutters to send butterflies, hearts, dinosaurs and spaceships to school in the lunchbox. Make shapes in bread, fruits and veggies, cheese -- whatever you can impress or punch out. Because lunch tastes better when it's fun. 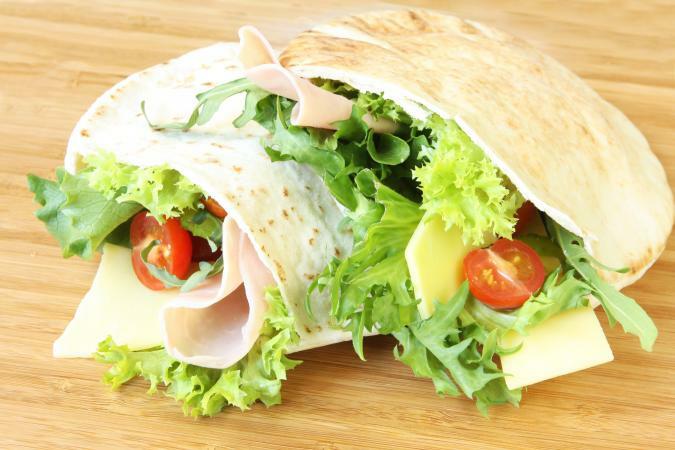 Wrap and roll-up: Kill it on protein with an easy-to-eat, even easier-to-make, main dish. Roll sliced Swiss cheese and turkey or ham together, secure it with tooth picks and cut the cylinder into bite-size segments. Roll a tortilla around slices of avocado or guacamole and Juliennes of nut cheese and crisp greens (Romaine is a mild favorite). Cut it in half for a grab-and-eat vegan veggie-blast -- use multi-grain tortillas for added nutrition. More stealth protein: Add a custardy mini-quiche with sweetened egg custard, raisins, shredded bland white cheese and a smidge of diced fruit (like pineapple or strawberry) baked in a mini-muffin pan. Boil edamame in the pods in salted water, cool in the fridge and pack a handful in the lunchbox. The green soybean is a self-contained, easy-to-eat snack that contains no cholesterol but delivers a significant amount of iron, calcium and protein. Don't tell the kids. When you have to pack utensils, wrap them in the napkin. It looks pretty and increases the odds that the napkin may actually get used. Save time and money by lunch-boxing your leftovers. Add a side-dish treat for variety and extra nutrition, et voila! Last night's dinner is today's nouvelle cuisine. Cold pasta with pesto is a great warm weather salad. Add a few cubes of cheese or some diced white chicken or turkey and a reusable or bamboo fork. A slice of leftover dinner quiche is fine at room temperature. Pair it with a sliced apple drizzled with lemon juice and maple syrup. Yum. Slit a pita pocket open and tuck in extra breakfast food: scrambled eggs with a smear of fig jam or orange marmalade and slices of extra-crispy bacon. That same pita pocket could corral last night's salad with the addition of a couple of rolled up slices of mild cheddar or Lorraine Swiss. For dessert, a ripe plum or a cup of pineapple chunks provides sugar-free sweetness. A wide-mouth thermos in winter holds the warmed-up turkey chili from Saturday night, to be eaten with a multigrain roll from Sunday's brunch and a handful of grapes that didn't make it into the fruit salad. Use that handy thermos another day for a portion of last night's mac-'n-cheese or the extra fruit salad from dessert. Whether it's in a brown paper sack or a monogrammed cartoon-covered thermal lunch box, a meal from home is a daily blast of nurture that helps a happy child to grow. The tricky math test, or the crayons that refuse to color inside the lines pale before the evidence that dad remembered you hate cottage cheese but you love Greek yogurt. Mix in a healthy dose of vitamins, minerals and fiber along with the love by balancing lunch fare with help from the USDA's food pyramid or another reliable source for nutritional guidance. Give yourself an A+ for lunches to balance that F for Fail you'll be getting from your Constant Critic for the broccoli or the brussels sprouts at dinner.